In pursuit of the most precise, accurate handloads you can possibly make, you've followed all the steps thus far - case selection, primer pocket uniforming, flash hole deburring and case trimming. The brass is all prepped and ready to go into your reloading press. Now, it's time to actually start sizing and reloading those cases. But to prevent a sticky situation, there's something you need to think about: case lubricant. Applying case lube sounds like a very simple procedure - basically placing some sort of lubricant onto the brass cases to keep them from getting stuck in the dies as you work them through your reloading press. But as with even the simplest of procedures, there are still things to consider. There are two big reasons why rifle cases get stuck in reloading dies. Not enough lube, or way too much lube. Not enough lube is pretty much self-explanatory. There's just not enough lubricity to keep the relatively soft, malleable brass case from sticking inside the harder steel die. Too much lube can cause a vacuum to form inside the die, suctioning the brass to the steel. With pistol cases, stuck cases can be minimized just by using carbide dies (#749-007-123) that are virtually stick-proof, without using lube. Most rifle dies require some lubrication of the cases, which can be accomplished several ways. Many reloaders start off with the old-fashioned lube pad (#749-010-623) - just a section of spongy foam that you smear some lube on and then roll cases across. Many of the big names in reloading equipment make lubricants for use on the pads – Hornady, RCBS, Lyman, and others. It's a quick, efficient way to apply lube to cases, and makes it easy to consistently apply as much lube as you need. Lube pads are also available in kits from Hornady (#749-012-865), RCBS (#749-010-613) and Lyman (#749-013-128) that have everything you need for lubing cases. As simple as lube pads are, they may not be the ideal solution for high-volume reloaders. Using a lube pad for just a few cases at a time is easy. Hand-rolling hundreds of cases across a lube pad can get very tedious and somewhat messy! High-volume reloaders often turn to spray-on lubricants such as the RCBS Case Slick (#749-001-341) or the Hornady One Shot (#749-001-065) to quickly lubricate large numbers of cases at once. An indispensable piece of gear that helps make spray lubing easy is a lube rack (#749-011-550) - a polymer block that holds cases upright and arranged to maximize their exposure to the spray. Load your cases into the rack, spray and you're done. Over the years, many benchrest shooters have come to trust Imperial Sizing Die Wax (#749-001-052) for their case lube needs. It offers high lubricity and easily wipes off with a paper towel. In fact, its lubricity makes it a popular choice for case forming, for those wildcat folks who need to form their own unique or obsolete cartridges. Unlike lube pads or spray lubes, sizing wax is applied more naturally. You just put a little on your fingers and transfer it to the cases by handling them. As simple and easy as Imperial Sizing Die Wax is to use, it's probably best for low-volume applications, like reloading the same 10 cases several times in a row. If you're trying to make hundreds of rounds at once, having to handle every single case just to lube them might get tiresome. The Imperial Application Media from Redding (#749-001-166) is a dry neck lube used to lube the inside of the neck, whether you're full-length sizing or neck sizing only. It consists of ceramic spheres coated with a fine graphite-based powder. You simply dip the neck into the container for a second to pick up the right amount of lube. This lube enables the expander ball to work smoothly throughout the case neck – instead of "grabbing" or "chattering" – to minimize case neck stretching. No matter what method you choose to lube cases, you have to keep your dies clean. Lubricants will build up inside the dies and will attract dust and other small debris. Using a Q-tip with a cleaner and degreaser (#100-006-800) is a good idea. 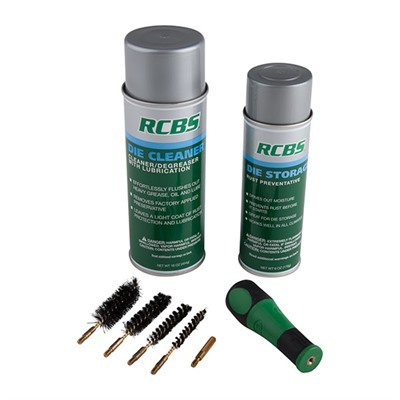 Or you can just get the handy RCBS Die Maintenance Kit (#100-200-249) that has everything you need to clean out reloading dies. Keeping lube buildup out of the dies is especially critical if you use something like the RCBS lube die. You simply squirt a little bit of RCBS Case Lube-2 into the special lube hole on the die, and it automatically lubricates the case as it enters the die. Sinclair is picking up these lube dies, and we'll have them available on our website very soon. Lubing cases is a simple but vital step in the reloading process. It makes sure the cases run smoothly through the various dies on your reloading press. Choose the lube and process that make the most sense for your reloading needs. And be sure to clean out your dies afterwards. Next month, we'll start running the cases through the sizing die, the first step on the actual reloading press on the way to finished ammunition.